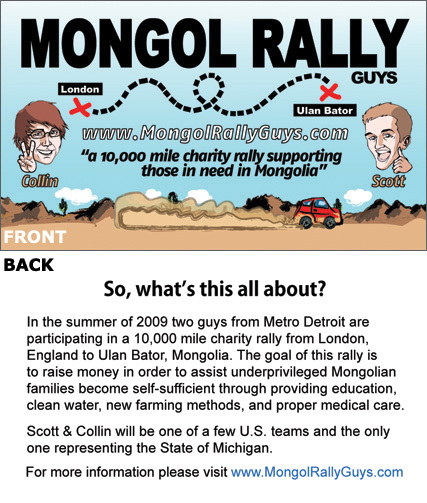 You’ll be doing a lot of promotion before the rally, trying to raise funds for charity and whatnot. The first thing you should do is get yourself a web site (GoDaddy sells domain names for about $10 and you can have it forwarded to anywhere) and print out some business cards. Amazingly, we were one of the only teams in the rally that had cards printed, and every other team thought it was a great idea but hadn’t thought of it themselves. Check out our cards, and then head on over to Prints Made Easy where you can get 100 full-color cards for $15! I would get more than that if you’re serious about fundraising though–I went through about 1500 myself.